~Tails from the Foster Kittens~: And then there were four.. ish..
And then there were four.. ish..
Darcy gave birth sometime Monday night. I found her and her babies in the corner where she had been hiding herself. Okay, that isn't strictly true.I saw her run into the corner and then I heard the tell tale mews of newborn kittens. The room was a bit of a mess. She had urinated on the sink and there was wetness on the ledge by the window as well. There was litter everywhere. I was getting a little perturbed with her when I heard the mews. I stood there contemplating what to do and I decided to set her up in the cage. I got some blankets and a sheet and something to secure the cage door open so she didn't need to have food and litter in there with her. I also set up the webcam so I could watch her. When I had gotten the room together I had to figure out how to move her without stressing her too hard and I figured the best way was quick and dirty. I removed the baby gate that was her protection and she tensed up quite a bit. I reached in and took out the kittens. The first two I pulled out had the placenta attached, the third had it removed. I put the kittens in a box I had prepared for them and stood up and got a pair of scissors to cut the cords. I then reached in and grabbed Darcy as best I could and pulled her out of the mess she had made and placed her at the entrance of the cage and guided her in. The towel I had put down in her in that corner was soaked and there was a lot of blood. There were two remaining kittens left and it was painfully clear that neither one of them were viable. I took a quick photo, peeked under the tails to see what was going on and found we had two boys and a girl, and gave each one to Darcy. She was happy to have them. I left food and water for her and went to work and turned on the webcam to watch them. She settled in very quickly and started nursing them right away. She relaxed pretty quickly and seemed happy with her new accommodations. I have gone down several times to get her used to the routine of my coming to visit. I walk on the stairs loudly. I announce my presence when I get close to the bathroom and then knock on the door. I can watch her on the webcam and see how she reacts to this. In the beginning, she would sit up and meatloaf leaving the kittens to mew and try to get back to the milkbar. After a few visits she remains in the nursing position and seems much more relaxed. Sometimes when I visit I peek in and scratch her chin and her ears, sometimes I just sit there and talk to her and tell her what beautiful babies she made. Although it might have had something to do with the ish part of the post title.. Because I went and did a thing.. but, more on that tomorrow.. I'm so sorry two kittens did not make it. Darcy is a good momma to her remaining kittens and you did such a great job with them. They are beautiful and it will be fun watching them grow and thrive. 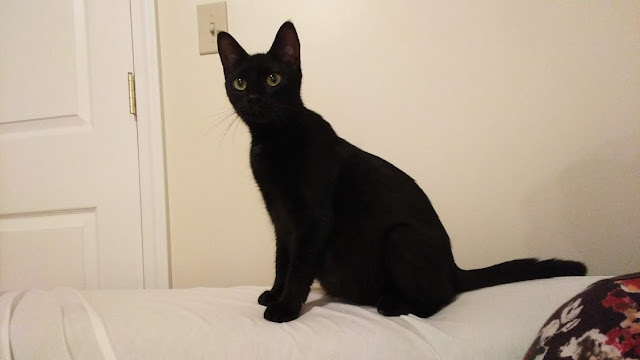 I say this often - but the kittens and Mom might've had a rough time before you came along to foster - but you'd better believe they'll get the absolutely best start in life now! Darcy and her kittens really needed your help, whether she realized it or not. I'm glad you are there for her. Welcome to the new guys! You are in the best hands now. 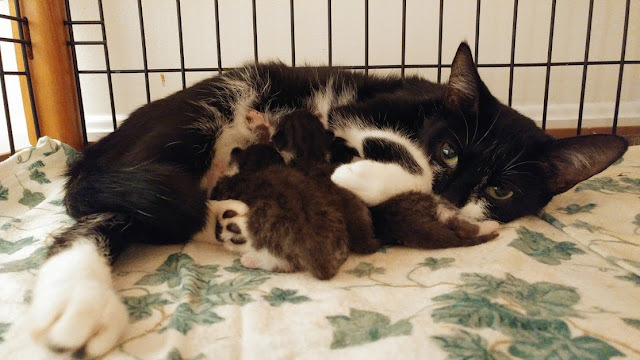 Darcy had a tough start, but her kittens are getting the best one possible. Paws up for that! She is a lucky girl to land where she is. Sweet picture of her and her babies! Wait, what? No fair teasing! But Darcy and her babies are beautiful. I'm glad she is making bits of progress. Purrs that the kittens thrive! I love how you said what beautiful babies she made. What lovely phrasing! It's really validating of what she's done and so true. But, glad Darcy is fine, and surviving babes are fine! Good job! With everything going on, Darcy has every reason to be kinda freaked out. You've done a great job of calming her. I'm so impressed! You are such a hero to me caring for cats like that. We know Darcy and her babies are in the best hands now. It's wonderful that she is doing well with her kittens, sad that a couple of them didn't make it. I love the fact you have her purring now - you're definitely a cat whisperer! The Pawpurrazzi is so annoying..